Has the time come to consider GaN solid state Block Upconverters rather than TWTAs for higher power? There has been a lot of press about Gallium Nitride (GaN) amplifiers and BUCs in recent years. Is this “new” technology really a contender to replace TWTAs in higher power applications? The higher power RF hub has been the domain of TWTAs (Traveling Wave Tube Amplifiers). Often, the TWTA is coupled with converters to upconvert the modem output from the 70 to 140 MHz Intermediate Frequency to the RF frequency at C-band, Ku-band, etc. The history of this industry has been that SSPA manufacturers have continuously strived to increase output power in an effort to displace the market space occupied by tubes. Solid state power amplifiers deliver longer life and are less delicate than tubes. However, because they are lower gain devices, it requires combining multiple solid-state amplifier devices to achieve the output power of a single tube. Device cost, combining losses at higher power levels and removing heat from devices put economic limitations on increasing power with solid-state amplifiers. GaN devices yield higher gain and higher power, reducing the quantity of devices required. GaN technology performance continues to improve, yielding higher power, gain, and more attractive packaging. However, the improvements do not come without challenges — more on those later. First, consider the linear or effective usable power of a 200W GaN IBUC compared to a 400W TWTA. The terms used to rate TWTAs and SSPAs are quite different. What matters is how much linear or effective power is delivered at the output. Maximum linear power (PLinear) is defined by the MIL-STD-188-164B stating that spectral regrowth is to be no higher than -30 dBc and third order intermodulation distortion (IMD3) to be no more than -25 dB relative to two carriers combined power. The chart below shows a comparison of linear output power illustrating that a 200W IBUCG delivers 2.5 dB more effective output power than a 400W TWTA. When the TWTA is equipped with an optional linearizer, the 200W IBUCG comes within 0.5 dB of producing the same amount of output power. How can a 200W device deliver the same power as a 400W device? This comes down to different ways in which output power has been stated by tube and solid-state amplifier manufacturers. TWTAs are rated at the saturated output power of the tube. The HPA manufacturer will typically then state output power at the flange and provide an IMD3 specification. From that, one can calculate the PLinear point meeting the MIL-STD definition. On the other hand, SSPA output power is rated at the flange. For GaN amplifiers, that is stated as the saturated output power level (PSat). The manufacturer will then state the PLinear output relative to PSat according to the MIL-STD on their data sheet. This is the crucial point. PSat in a sense does not matter. It does not provide a useful value when comparing dissimilar amplifiers. In comparing TWTA to solid-state amplifiers, it is the linear power — the effective or usable power — that matters. It is necessary to normalize to PLinear to compare two amplifiers. In a well-implemented GaN BUC/SSPA, the amount of back-off required to achieve PLinear is much less than that of a TWTA. That is what is seen in the example below. A 200W Ku-Band IBUCG only needs 1 dB of output power back-off to meet the PLinear definition. A TWTA requires 6 to 7 dB of back-off. That can be improved to 3-4 dB with the linearizer option. However, a linearizer adds cost and complexity that also must be factored into the decision-making. Size and weight are often critical issues for mobile systems. A constraint with GaAs (Gallium Arsenide) solid state amplifiers has been the amount of space required to combine and cool multiple devices. With the higher power density, GaN technology enables the RF unit designer to pack more power into a smaller space. A GaN IBUC2G weighs half as much as an equivalent output power TWTA and occupies much less than half the space. Like the higher power hub example, a 100W Ku-band IBUC2G will deliver more effective output power than a 200W TWTA without its linearizer option — in a much smaller and lighter package. An additional feature of GaN amplifiers is that they are more efficient in power consumption. 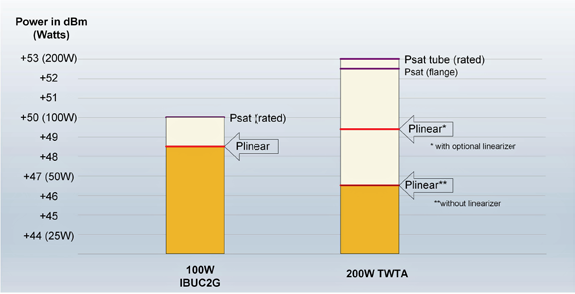 Again comparing to equivalent linear power TWTAs, there is now little difference in the amount of power each consumes. As mentioned previously, there are challenges. There always are tradeoffs in RF design. GaN amplifiers have different performance characteristics than GaA. One of the most noticeable differences is that the GaAs power transfer curve is linear. Each 1 dB of additional input transfers to 1 dB of power output. With a GaN amplifier, in the usable range, a 1 dB increase in input results in something less than 1 dB in output power. It is possible to compensate with an AGC loop where the gain of the driver amplifier is adjusted to keep overall gain of the unit constant. This could come into play in Uplink Power Control systems for example. Another characteristic of GaN amplifiers is that there is a limitation where further output power back-off yields no improvement in spectral regrowth and IMD3. That is, there is a “floor” where the intermodulation distortion performance does not get any better. This can be a factor in multicarrier operation where IMD3 is the key performance requirement. When planning a multicarrier hub, it would be prudent to consult with the manufacturer. Over the last 15 years the industry has largely made a transition from IF modems, converters, and HPAs to L-band modems with Block Upconverters. Cost, reduced complexity, and reliability drove the change. Today we are seeing a similar transition of upgrading from tubes to higher power SSPAs. The reasons are similar — simpler, more robust design at a comparable or reduced cost. In the future expect to see even higher power SSPAs covering more bands. 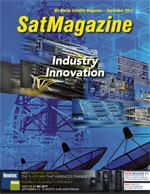 Ron Merritt is Terrasat Communication’s Regional VP Business Development for Europe, Middle East and Africa. He has over 25 years of experience in the microwave and satellite industry involving projects for satellite ground stations, terrestrial links, and airborne systems.